This module is a low cost embedded UART-ETH- WIFI Module (Serial port -Ethernet- wireless network) developed by Rajguru electronics. 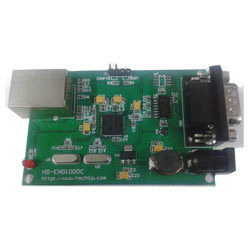 This product is an embedded module based on the Universal serial interface network standard, built in TCP/IP protocol Stack. enabling the user serial port, Ethernet, Wireless Network (WiFi), interface between the conversions. Through the module, the traditional serial devices do not need change any configuration; data can be transmitted through the internet network. Provide a quick solution for the user's devices to transfer data via ethernet. 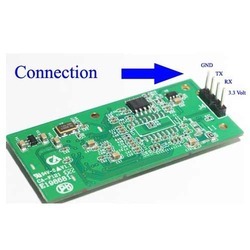 We are one of the leading suppliers and traders of UART To Wi Fi Module. Our range of product-line is a complete ultra low power embedded TCP/IP solution. These are manufactured using high-grade raw materials and are procured from trusted vendors and are provided after in-depth research regarding the market trends and clients demands. 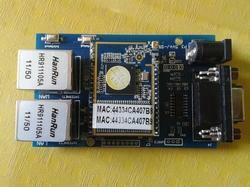 Support for UART data serial, four baud rate options: 19200 / 38400 / 57600 / 115200bps. Wireless data rates support the 802.11b Standard, the maximum rate is 11Mbps. In the automatic networking modethe module can automatically scan the target network, and automatically connect when disconnection. We are one of the leading service providers and traders of UART To Ethernet Module. Our products are widely known and appreciated among our clients as these are procured from the trusted vendors and ensures high-grade quality of products. Our products are made after stringent quality tests and are availed without any compromises with the quality.